The Days of Johann, an agility dog! : Tomorrow is International Dog Biscuit Appreciation Day! Tomorrow is International Dog Biscuit Appreciation Day! Dog! I know you like dog biscuits just as much as I do! So I'm pretty excited that tomorrow is International Dog Biscuit Appreciation Day - a day to appreciate one of our favorite things! Here's a great site with tons of dog biscuit recipes! Check out my Squidoo lens on my favorite homemade dog treats! Mum just taught me to catch treats in mid air, but here are a couple of pups who have it down to a science. Check out this vid - synchronized dog biscuit catching and eating - more, more! Need a dog biscuit, paw print, fire hydrant or dog house cookie cutter? A bone muffin pan? Watch this pup catch a biscuit from his nose in slow-mo! If you'd like to remotely dispenses those amazing biscuits to you dog when you're gone, check out this cool remote dispenser triggered by Instant Messaging. Or if you'd like to see Bender's cool dog biscuit dispenser, check this out! And last but certainly not least in dispensers, check out this iPhone power dispenser. Got a biscuit, teach a dog a trick! 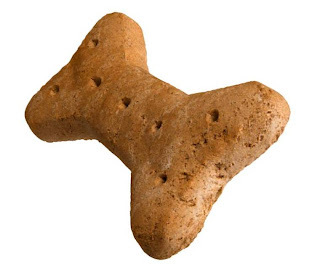 Read about the history of dog biscuits! Oh what us dog's have to go through to just get a doggone treat! BOL! And check out this one in slow mo! What's my favorite biscuit besides the ones my Mum makes? Enjoy International Dog Biscuit Day! Ooo! I'll have to cook up some treats for my girls too! Nope, I didn't make it up, I think there are even ecards for the super cool day! Guess we're going to have to search for more yummies.